Assignment roles are used to define responsibilities such as Designer, Analyst, Manager, or Change Advisor. Each role is comprised of groups and users. Entities such as To Dos, forms, reports, pages, or service catalog items can be assigned to assignment roles, as well as users and groups. To create an assignment role, navigate to System > System Data > Assignment Roles	and click the Create Assignment Role	button. Add an account and a group to the assignment role. Access a flow, then assign a form in the flow to the assignment role. Navigate to theMy Home	folder to see the task assigned to us in the Tasks	list. 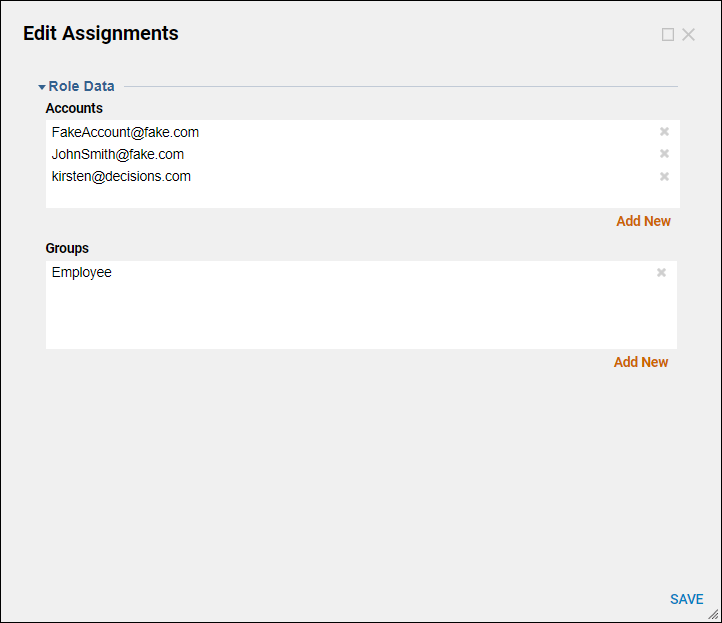 Begin in the portal by navigating to System > System Data > Assignment Roles	and clicking the Create Assignment Role	button. In the resulting Create Assignment Role dialog, select the Name	field and type "Assignment_Role". Next to the Default Accounts	list, select the Add New	link. In the resulting Select Account dialog, select an account or two then select OK.
Next to the Default Groups	list, select the Add New	link. In the resulting Select Group dialog select a group then select OK. This completes the assignment role, select Create. To see the new assignment role in action, navigate to a Designer Project folder, Designer Folder. Edit a pre-designed flow called User Info Flow. 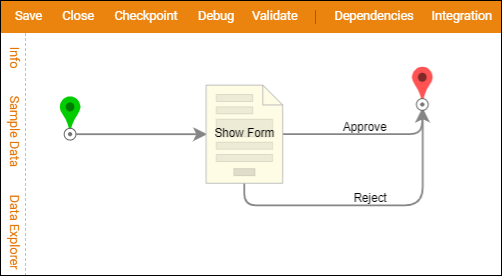 In the Flow Designer , select the Show Form step. In the Properties panel, under the Assignment Setup	section, select Assigned in the Assignment Type	drop down. Under the section Form Assignment > Assign >	Assign To Role	select the Pick	link. In the resulting Select Assignment Role pop-up, we will select Assignment_Role	and click OK	. Selecting edit in the above field (Assignment	) allows a popup window to change settings of the assignment. For Assignment Name	, we will select a Mapping type	of Constant	and fill in Value	with "Assigned to Role". For Assignment Action Name	, we will select a Mapping type	of Constant	and fill in Value	with "Form". This completes the flow, save and close the Flow Designer . 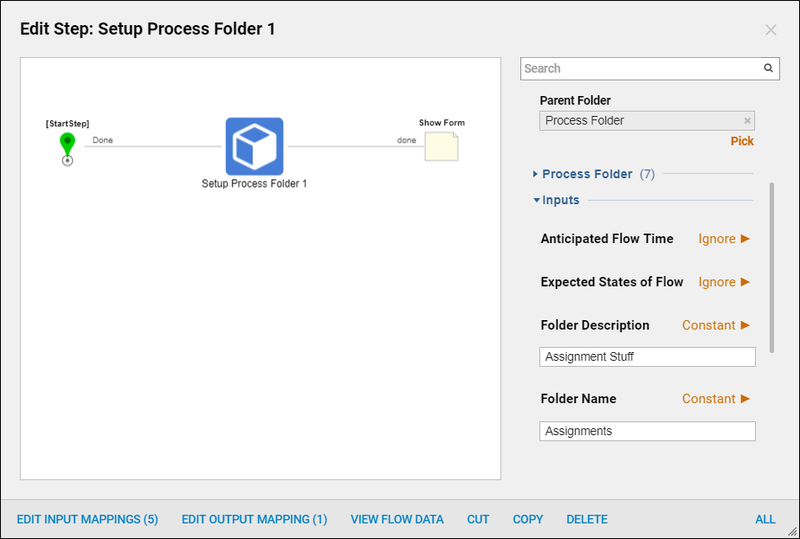 Back in Designer Folder, we will select the flow and, in its Action	menu, select Run Flow. The form in the flow is assigned. To see the assignment, decline to fill the form out immediately by clicking No on the dialog. Navigate to the Process Folder	where the assignment lives, here you can see the details regarding the assignment and complete it.